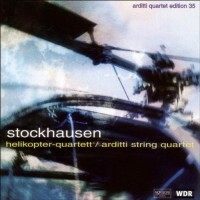 Karlheinz STOCKHAUSEN: Helikopter-Streichquartett. Arditti String Quartet. Montaigne MO 782097. Forever the enfant terrible, Karlheinz Stockhausen is somewhat remote from new audiences, especially audiences here in the US. Concern over the performance practice of his music (i.e., total artistic control) yields few recordings and performances. But Stockhausen isn’t really that remote: check out http://www.stockhausen.org/ where eager acolytes glow about the great man’s activities, his upcoming concerts and his recent music. Stockhausen’s recent works are published exclusively by Stockhausen Verlag, and they are available at the site. Scores, recordings, videos, posters, etc., fetch a high price — the exchange rate notwithstanding — though they come with detailed and colorful notes and annotations that are Stockhausen sanctioned. Stockhausen place in the history books of the 20th century is assured through such classic works as Kreuzspiel, Gesang der Jünglinge, and the several Klavierstucke. The Klavierstucke are available in several recordings, though Kreuzspiel, Gesang der Jünglinge, and other works which originally appeared on DG are out of print. Stockhausen Verlag does offer recordings, but they might be priced out of bounds for the casual listener. A somewhat recent disk with Gruppen appeared in import bins in the USA and seems only available in Europe. Stockhausen’s inaccessibility shouldn’t give the impression that he isn’t doing anything. His huge seven day opera/creation event Licht is perpetually in progress, and the premiere of Wednesday from Light is due at the Bonn Opera in May. And now we have this recording of the Helikopter-Streichquartett, a 1995 work on Montaigne priced accessibly and readily available in the US. Commissioned in 1991 for a projected performance in ’94, Stockhausen, who could never write just a string quartet, had a dream: “I heard and saw the four string players in four helicopters flying in the air and playing. At the same time I saw people on the ground seated in an audiovisual hall, others were standing outdoors on a large public plaza. In front of them, four towers of television screens and loudspeakers had been set up… At each of the [four screens] one of the four string players could be heard and seen in close-up.” Obviously the logistics for a performance of this work are immensely complicated. It took until 1995 for a performance to be realized with the great cooperation of all sorts of state authorities and sponsors. The making of the commercial recording also had its trials which are recounted on Stockhausen’s site for those who are interested. Even the experienced listener (maybe even a Stockhausen fan) will find this quartet a chore to listen too. The strings are only slightly louder than the omnipresent helicopter pulsing and whirring. I imagine the correct playback volume for this work would be just short of deafening; this is not a work for headphones or to play in the car on the commute home (unless of course, you take a helicopter home). The starting of the helicopters is actually quite invigorating: Audiophiles might get this disc just to have crystalline recordings of 4 helicopters starting up. I suspect experiencing this work as Stockhausen intended is probably the best way to go: in person with the video screens and post-performance Q&A session. There is a video of a performance of the quartet sanctioned and distributed by Stockhausen Verlag. I heard this work alone the first few times, and I think even in a well intentioned group, it will be hard to suppress giggles. The Arditti is the best quartet out there for this sort of thing, and they bring a dignity to this performance which no other group would ever match. A performance of this work could easily degenerate into absurdity: the string writing is predominantly tremolos and raspy glissandi which are punctuated by theatrical declamations of numbers in German (“vier” with a rolled “r” recalling George Crumb) and this is distinctly Stockhausen at his mystical, cosmic best. Montaigne seems to be changing their marketing strategy with this disc (Arditti Quartet Edition No. 35): It’s about half the price of most of the other discs they release, and the silk-screened disc (bright “iMac” style lime green) and the CD tray and booklet cover (blurry helicopter more suitable for a documentary on the horrors of war) breaks with the studied format they have established for their excellent series on Montaigne. It’s good that Montaigne is moving in this direction, their label deserves a wider audience.